The players in the $1,000 NLHE Deep Stack event are now on a 10-minute break. There are 67 players remaining and the blinds are about to be increased to 600-1,200 with a 200 ante. The average chip stack is currently just under 60,000 chips. $1,000 Deep Stack Now Streaming Live! We are now streaming the feature table of the $1,000 NLHE event. Just click "Watch LIVE Video" at the top of the page to view the live video. 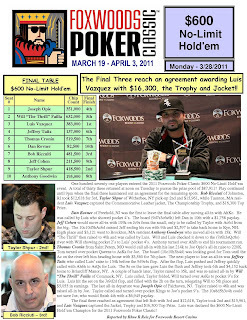 The final three players in the $400 Pot-Limit Omaha event came to an agreement on an equity chop. Pat Morris took home $5,060, Mario Renzulli pocketed $5,229 as well as the trophy and Mike Delaney won $5,396 and the leather jacket. Roger Fisette is today's Cabot Cheese Extra Sharp Player of the Day. 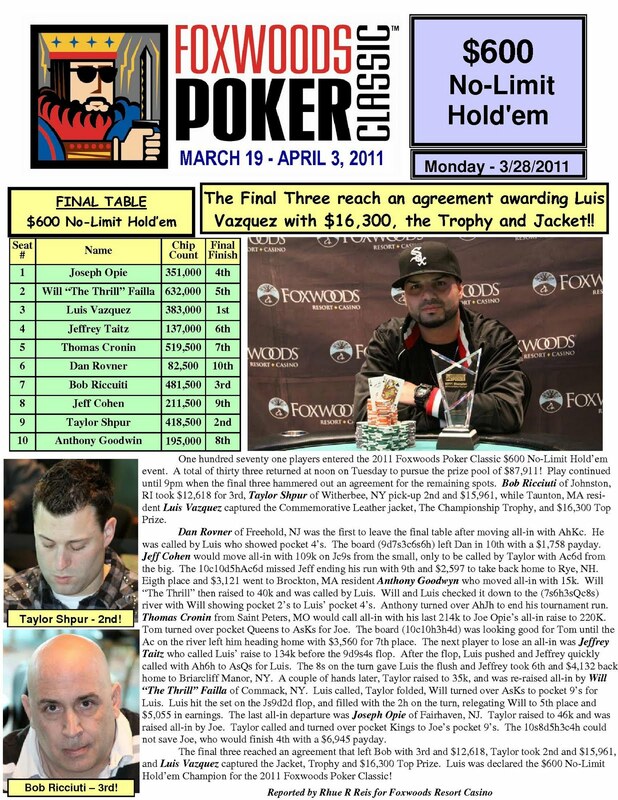 Roger bested a field of 375 players to win the $300 NLHE Deep Stack event at the 2011 Foxwoods Poker Classic. Roger took home the trophy, leather jacket and over $16,000 for his victory. $400 Pot-Limit Omaha Now Streaming Live! Day 2 of the $400 Pot-Limit Omaha event is about to get underway. Six players remaining and all are now in the money. To watch the live stream of the final table, click "Watch LIVE Video" at the top of the page. We had a total of 158 players in the $1,000 NLHE Deep Stack event. Will Failla and his opponent got into a raising war before the flop and got all the chip in the middle. When they turned their cards over, both player had pocket aces. 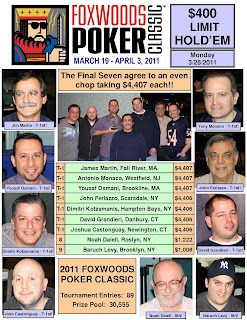 The flop came down with two clubs and Failla held the ace of clubs. He yelled, "FREEROLL!!!" and proceeded to bink a club on both the turn and the river. His ace high flush took the pot to eliminate his opponent and boost Failla's stack up to over 40,000 early on Day 1 of the $1,000 NLHE event. 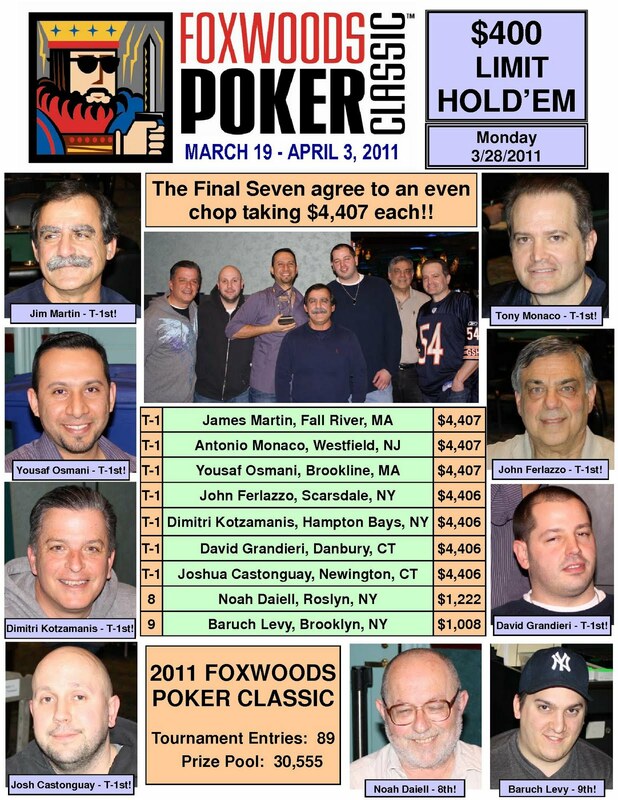 The players in the $1,000 No-Limit Hold 'em event at the 2011 Foxwoods Poker Classic are on their first 10-minute break of the day. There are over 150 players in today's field with registration still open. $1,000 Deep Stack Event Underway! The $1,000 No-Limit Hold 'em event is now underway. Players are starting with 25,000 in chips and the levels are 50 minutes in length.